Chester will travel to Tranmere Rovers in the quarter-final of the Cheshire Senior Cup after they defeated Stockport Sports 6-0 in their second round match last night, a victory that included an Iain Howard hat-trick. The Blues dominated the opening half but only had one Howard goal to show for their efforts but they stepped up a gear following the break scoring twice in the opening five minutes through Howard and Marc Williams. Martin Fearon saved a spot-kick after George Horan had fouled Josh Miller in the penalty area. Neil Young introduced youngsters Sean Miller and Tom Peers into the action before Tony Gray and Antoni Sarcevic, following a Peers set-up, added to the score sheet. Peers showed nice skill again as he send Howard through for the winger to complete his second treble of the season, six minutes from time. The away league game at Colwyn Bay on Saturday 30 March is now all-ticket and will kick-off at the earlier time of 13:00hrs. The home second round game in the Cheshire Senior Cup against Stockport Sports will now be played on Tuesday 29 January, kick-off 19:45hrs. Admission prices are as follows: adults £7.00, concessions £3.00, under 16s £1.00. Just the main stand will be open for this match. Craig Curran has returned to Rochdale following his extended loan spell. The forward initially came on a one month loan, but so successful was his initial spell, that it was extended thanks to some local businessmen who helped fund the extra four weeks. Curran made 11+2 appearances and scored 7 goals including a hat-trick after coming on a substitute (against Bishop’s Stortford), something that no other Chester player has ever achieved. The home second round game in the Cheshire Senior Cup against Stockport Sports tomorrow night has been postponed due to a frozen pitch. 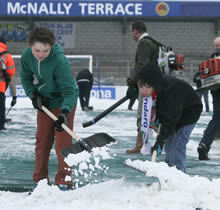 Around 100 volunteers turned up on Saturday morning to help clear snow from the pitch covers and car park to enable Chester to stage the only Conference North match of the day. The covers did their job to reveal the pitch in a great condition once they were lifted before the referee’s pitch inspection. Still partially snowbound, the Harry McNally terrace was closed for the day with the home end regulars occupying the south stand for the afternoon. The volunteers hard work was rewarded hours later as Chester recorded a 4-1 victory over Stalybridge Celtic, to leave them 16 points clear of second placed Guiseley who now have four games in hand. Just like last week at Hinckley United, the Blues started strongly and once again Nathan Jarman opened the scoring with a sharp shot on 11 minutes. George Horan doubled the advantage as he headed home the second just before the half hour with Marc Williams scoring a third goal two minutes before the break. Celtic pulled a goal back with a fine free kick from substitute Jack Laird, goalkeeper John Danby collided with a post trying to save the effort and appeared in some discomfort for the rest of the match. With time running out Wes Baynes unleashed an unstoppable 30-yarder in the dying minutes to seal the well earned victory. Thanks to a remarkable effort from groundsman Steven Ollerenshaw and around 100 volunteers who this morning cleared the pitch covers and surrounding areas of snow, this afternoon’s match against Stalybridge Celtic is on. The Harry McNally terrace will be closed today but the South Stand will be open for ticket holders and cash entrance at terrace prices. This is the only match in the Conference North to be played today. There will be a 10:30 pitch inspection tomorrow ahead of the home league game against Stalybridge Celtic. The club are looking for volunteers to help clear the snow off the covers at 09:00hrs in the morning, the covers will then be removed at 10:00hrs. The Cheshire Senior Cup second round match against Stockport Sports, who play in the North West Counties League Premier Division, will now take place on Wednesday 23 January, kick-off 19:45hrs. Following a pitch inspection at Chester this morning, and with temperatures set to drop below freezing later today, tonight’s Cheshire Senior Cup second round match against Stockport Sports has been postponed. The away fixture at FC Halifax Town scheduled for the end of the month has been postponed due to the Shaymen’s continued FA Trophy campaign. The league game at The Shay will now take place on Tuesday 26 March, kick-off 19:45hrs. 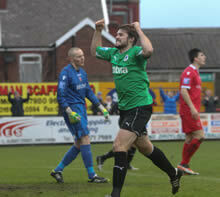 Chester maintained their fine run with a comprehensive 6-0 victory at Hinckley United on Saturday. Nathan Jarman got the Blues off to a flying start heading home after just 70 seconds and further goals from Craig Curran and Antoni Sarcevic extended the lead before the break. Sarcevic scored his second soon after the restart and substitutes Tony Gray and Scott Brown wrapped up the scoring in the final 18 minutes. Chester remain 13 points clear of second placed Guiseley who have three games in hand. The next City Fans United meeting will take place on Wednesday 30th January in the Blues Bar, starting at 19.30hrs. New members can sign up on the night for the annual fee of just £5.00. It is hoped that Blues manager Neil Young will attend the meeting to take part in a Q&A session. Michael Wilde, Greg Stones and Mike Aspin are the first ex-Chester FC players to join the club’s revamped Former Players Association. This follows a change in the organisation’s constitution, which now allows ex-players of the new club to become members. Previously, only former Chester City players were eligible. To reflect the change the FPA has launched a new website. It can be found at the same web address as its predecessor, www.formerchesterplayers.com. The new site gives greater prominence to news stories and has easier navigation. It includes a full list of FPA members, details of social activities and an obituaries section. The site also features a new logo, designed by Martin Huxley, which links the badges of the two football clubs on a blue background, preserving the memory and tradition of the original club alongside the contemporary style of the supporter-owned team. The Association also has a new Facebook page which is already racking up the ‘likes’: Chester Former Players Association. Chester entertain Stockport Sports in the second round of the Cheshire Senior Cup on Tuesday night, kick-off 19:45hrs. Admission prices are as follows: adults £7.00, concessions £3.00, under 16s £1.00. Just the main stand will be open for this match. Luke Denson has left Chester to join AFC Fylde. 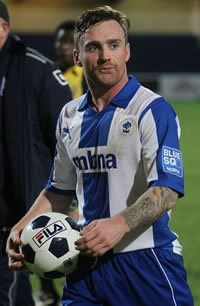 The defender made 5+0 appearances for Chester after signing from Colwyn Bay. Chester moved 13 points clear of second placed Guiseley following a comfortable victory over Oxford City on Wednesday night, the Yorkshire side do have three games in hand. The visitors had endured a long delayed journey following an earlier hold up on the M6 motorway, it meant they reached the ground just before 20:00hrs, with the match kicking off 30 minutes later. The Blues took the lead through Paul Linwood who notched his first goal of the season in the ninth minute heading home from a Wes Baynes free kick. Chester created several other chances of note but didn’t add to their tally until just before the hour mark when Nathan Turner picked out Nathan Jarman with an inch perfect pass for the striker to steer the ball past Ingram in the Oxford goal and into the far corner of the net. Chester are next in action on Saturday when they travel to play bottom of the table Hinckley United, kick-off 15:00hrs. Chester’s winning streak of twelve matches came to an end on Saturday when a series of missed chances, including one from the penalty spot, as well as a string of good saves from John Lamb in the home goal, denied them victory at Bradford Park Avenue. In the end the Blues had to settle for a 0-0 draw, it was the first time Chester had failed to score in the league for an incredible 62 matches. The best chance of the game came twelve minutes after the restart when the Blues were awarded a penalty but Matty McGinn saw his effort, low down in the left hand corner, saved at full stretch by the impressive Lamb. The Blues also saw two efforts ruled out for offside in a frustrated second half. The first half had been a much more even affair with tempers short at times, Craig Curran, McGinn and Antoni Sarcevic all received yellow cards with the referee having to break up three melee’s on the heavy Avenue pitch. With Guiseley winning 5-2 at Bishop’s Stortford, Chester’s lead at the top has been reduced to 13 points, having played three more games that their rivals from Yorkshire. The Blues are next in action when they entertain Oxford City on Wednesday night, kick-off 19:45hrs. The club shop will be holding a sale beforehand with plenty of bargains to be had by all. Booth first played for Chester City between 2004/05 before joining Southport. He rejoined Chester from Droylsden in September 2010 and made 56+21 appearances for the club scoring 14 goals in the process. An injury prevented him from making any appearances this season and he joined Vauxhall Motors for a loan period recently. Midfielder Nathan Turner has had his loan deal from Leeds United extended by another month. After three appearances from the bench, Turner made a first start at Droylsden on New Year’s Day and scored Chester’s fourth goal. A superb opening period at Droylsden set Chester up for their twelfth successive victory on New Year’s Day. Antoni Sarcevic, Craig Curran and Danny Williams all scored in the opening eight minutes. The Bloods pulled a goal back through ex-Chester player James Ellison, before Nathan Turner curled home the fourth goal to give Chester a dominating 4-1 half-time advantage. An injury to George Horan in the second period saw the captain replaced and Ellison set up a nervy finish as the Blues, like at Brackley last month, conceded two goals in the final minutes as the Droylsden striker completed his hat-trick. But Chester hung on to remain fifteen points clear of second placed Guiseley who completed a festive double over Bradford Park Avenue. Chester face seventh placed Bradford Park Avenue on Saturday, kick-off at the Horsfall Stadium is 15:00hrs.